Today I want to share these Sensory Processing Disorder at home ideas,Â because if you have a child with sensory issues, it can be the difference between a great day and a not-so-good day.A few months ago,Â on a rainy day in the cold partÂ of winter, I went with my son’sÂ class toÂ an amazing bright, well-lit, colorful museum built just for kids their age. Most of theÂ seven and eight year olds were so excited, itching to run around and explore. I looked over to see John, my son’s classmateÂ with sensory processing disorder. Â He was going further and further into his own shell. Â What is excitement to some children is scary to him. Sometimes, sensory processing disorder can look different than you’d expect. As a former teacher myself and now a child developmental therapist,Â I knew that John needed to be treated a little differently than the rest of the class to be able to enjoy this museum as much as the other children. I took the lead on this one, to help out the teacher and it turned out to be a great day and everyone enjoyed their time there, including John. It madeÂ me realize that while so many of us have heard of SPD, it isn’t until you are “in the moment” that you are looking for things to do with your child. So I wanted to bring you five ideas for working with your child with Sensory Processing Disorder. Sensory aids are a great tool, along with some of the suggestions below. I do this daily in the homes of the families that I work with and most of the children have a great response to them. Our son (he has a mild case of SPD) responded very well to â€œbrushing,â€ which is a tool for children with tactile defensiveness. Â Most Occupational Therapists are trained in brushing. We use a soft-bristled brush (you can buy them specifically for this. Â They are unlike any brush I had ever seen before we started using them) and we have had to learn the different protocols to find the one that worked best for him. JointÂ compressions areÂ a form of proprioception. Â It happens because of a pull or tension on the joint. Â Most of my clients find it to be very regulating to their nervous system. Â It gives the child spacial awareness, as well. Â I highly suggest watching multiple YouTube videos and asking a therapist for help while learning to do these on your child. Some children are more hyperactive and actually seek sensory opportunities. Â For these children, try letting them move furniture around, push the shopping cart, carry heavier things, like grocery bags or laundry baskets filled with clothes. 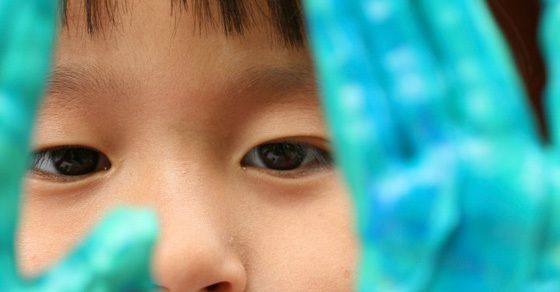 For the tactile sensitive child, try finger painting. Â Our son LOVES to paint and play with shaving cream. Â I actually get a cake pan, fill it with shaving cream, add a few drops of food coloring and let him finger paint with it onto a sheet of poster-board or even just printer paper. Â It is messy, but it is worth it. Jumping on the trampoline is another idea that has worked well for my clients. Â The feel of landing is their favorite part. Â It is a hard land that stimulates their brain and ‘pushes back’ to their body. Â Â The repetitive stimulation of jumping onto that sort of surface actually helps their body. Â A small indoor trampoline works well. Check out this article about how to make a sensory rice bin for your child. For more parenting and teaching tips, stop by our Facebook Page, where we talk about things like this on a daily basis.